This is a 1956 Parker 61 Prototype “Wick-fill” in Black with ORANGE SHELL. Brushed Lustraloy (stainless steel) cap with GF clip and barrel tassie (the cap design is unique to 61 prototypes). Inlaid in the barrel tassie is a stainless steel mesh screen. The barrel end is put into the ink and the wick draws ink into the barrel through the screen. Hooded nib (fine), no arrow in the shell. Medium/fine nib. New-old-stock. Mint. Item #223 in Catalog #84. 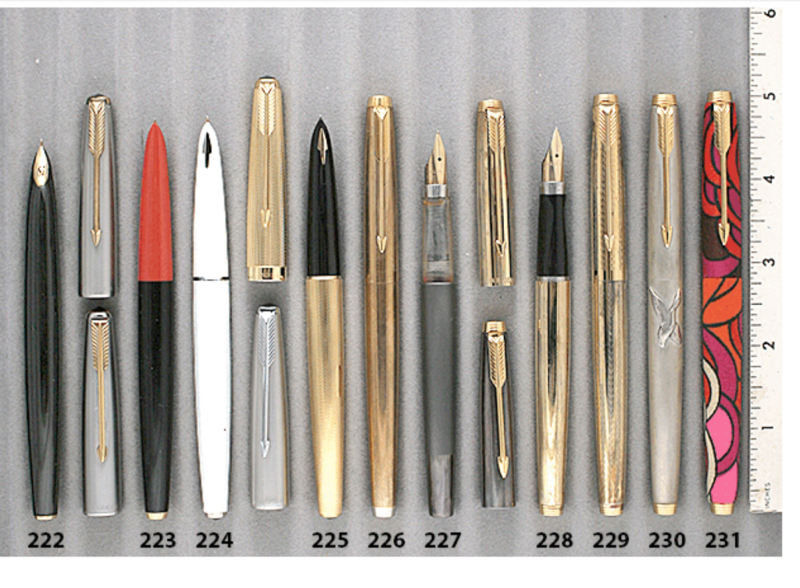 This entry was posted in Vintage Pen, Vintage Pens and tagged Catalog, Catalogs, Extraordinary Pens, Fountain Pens, Go Pens, GoPens, Parker, Prototype, Vintage Fountain Pen, Vintage Fountain Pens, Vintage Pen, Vintage Pens. Bookmark the permalink. Follow any comments here with the RSS feed for this post. Post a comment or leave a trackback: Trackback URL.